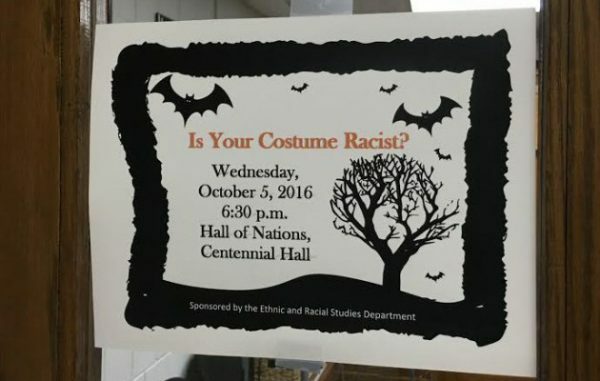 The University of Wisconsin-LaCrosse is continuing to make headlines for what some believe is going too far to protect students from being offended, this time by holding a review of Halloween costumes to make sure nobody is accidentally racist. The event is to be hosted by Dr. Richard M. Breaux, an assistant professor in the Ethnic and Racial Studies Department, who also offered the presentation two years ago. We spoke to Breaux who explained that he will be providing a discussion on costumes using slides, and that students will not be dressing up. He considers the course a “public service,” as students, admittedly sometimes unintentially, often find themselves in trouble for their choice of Halloween party attire. “We would rather say hey be mindful, instead of having a photo appear on a social network and get into trouble,” Breaux explained. Asked if he agrees with the punishing of students who meant no harm and accidentally caused offense, Breaux explained that it comes down to “intent and impact,” and that students should attend the event to be proactive and not make that mistake. “The first line of defense is to try to educate people so they don’t make the mistake,” he stated. The October 5th event is just the latest incident at the university to spark controversy online about the possible pandering to outrage culture on the UWL campus. Last week, it was reported that one student had lodged a very serious complaint with the campus “hate response” team over a Harry Potter mural in one of the dorms. The mural in Laux Residence Hall was of Neville Longbottom, who was a nerdy goof in the films and later became a handsome stud. It jokingly showed paintings of the character “before and after Laux,” playfully asserting that the dorm makes you hotter. In another incident in April, the school’s “hate response team” investigated chalk drawings that simply supported Donald Trump after he held a rally in town. “The Hate Response Team is aware of several chalkings across campus that promote Trump 2016, including messages like “Build the Wall,” “All Lives Matter,” and “Stop Illegal Immigration.” While we respect peoples’ right to express their opinions, we also recognize that some communities on campus experience these messages as discriminatory or hostile. All manifestations of prejudice and intolerance are contradictory to our mission as a university. If you experience any bigotry on or off campus, please turn to trusted friends and/or campus resources for support. You can also file a hate/bias incident report here. Media Trackers also reports that in December, school officials went to law enforcement over a truck driver working with a private company who had a rebel flag on his truck’s grille. The man was doing work on a building project on campus, and apparently causing offense is reason for this school to involve the cops. Vice Chancellor Paula Knudson, who had went to the police over the flag, apologized to students who may have experienced “fear or angst” over it. College is meant to be a time to share different ideas, and learn to live and function in a world with people who don’t always share your views or life experiences. The current war on free speech and freedom of expression on campuses across the nation is not only hurting those ending up on the wrong side of the witch hunt — but also the students who are essentially being protected from experiencing even the mildest negative emotions. How are these young adults expected to function in society once nobody is there to protect them from experiencing disagreements? PreviousCongressional Leaders Caving to Saudi Pressure on 9/11 Bill?